This textbook is endorsed by OCR and supports the specification for AS and A-Level Classical Civilisation (first teaching September 2017). 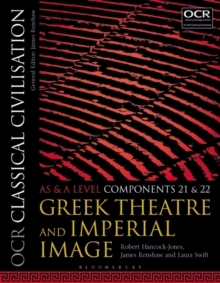 It covers Components 21 and 22 from the 'Culture and the Arts' Component Group:Greek Theatre by James Renshaw and Laura SwiftImperial Image by Robert Hancock-JonesWhy was tragedy and comedy so central to Athenian life? How did drama challenge Athenians to reflect on their way of living? How did the emperor Augustus present himself as the restorer of Rome's greatness? To what extent did he provide an example to later political figures as a promoter of his regime? This book guides AS and A-Level students to a greater understanding of these issues. The Greek Theatre chapter explores the festival context in which tragedies and comedies were performed, and then analyses three plays: Oedipus the King by Sophocles, Bacchae by Euripides and Frogs by Aristophanes. The Imperial Image chapter analyses the self-presentation of Rome's most dynamic emperor, who claimed to have found Rome `a city of bricks, but left it a city of marble'. The ideal preparation for the final examinations, all content is presented by experts and experienced teachers in a clear and accessible narrative. Ancient literary and visual sources are described and analysed, with supporting images. Helpful student features include study questions, quotations from contemporary scholars, further reading, and boxes focusing in on key people, events and terms. Practice questions and exam guidance prepare students for assessment. A Companion Website is available at www.bloomsbury.com/class-civ-as-a-level. Discover bookshops local to you. Enter your postcode and search for your nearest Hive network shop. © Hive Store Ltd 2019. (hive.co.uk) is registered in England. Company number: 07300106. VAT number: 444950437. Registered address: 1 Whittle Drive, Eastbourne, East Sussex, BN23 6QH.